Karadžić, life imprisonment for the "good neighbour"
In the appeal trial, Radovan Karadžić's defense argued at one point that their client, being "a poet and a psychiatrist, lacking military training, not prepared for a war", could only be innocent. Wednesday's final verdict delivers the opposite truth to law and history, establishing that Karadžić, the "good neighbour" , the "good colleague" who sent Bajram wishes to his Muslim friends, the "chameleon with manners that would be comical, if his words and actions had not marked the destiny of so many human lives", played a decisive role in the 1992-95 war in Bosnia and Herzegovina. The former president of Republika Srpska planned the operations, gave orders, received information on the four "criminal enterprises" for which he was sentenced to life imprisonment: the Srebrenica genocide – or the physical elimination of the town's Muslim population through the killing of men and the forced evacuation of women and children; the terror against the civilians of Sarajevo through a campaign of bombings and snipers; ethnic cleansing against the non-Serbian population in various municipalities in the whole of Bosnia and Herzegovina; the taking of UN personnel as hostages. These are the theses of the 2016 first-instance verdict of the International Tribunal for the Former Yugoslavia, fully confirmed by the MICT. The MICT raised the sentence to life imprisonment on the grounds that "Karadžić's responsibility for the most serious crimes ever attributed to a single person to the ICTY" could not allow for a milder sentence. The sentence mentions the four defendants who got a life sentence for committing "fractions" of the set of crimes for which Karadžić was held responsible: Bosnian Serb officers Tolimir, Popović, Beara, and Galić – all subordinated to Karadžić who, as president, was also the supreme commander of Republika Srpska. It would therefore have been “incongruent”, continues the sentence, to issue a lower sentence for Karadžić, as did the Court of First Instance in 2016, with a 40-year sentence which was much criticised by the associations of victims and civil society. The choice of the MICT must also be read in terms of the balance of international justice. At the final closure of the cases on the former Yugoslavia, there are only two appeal sentences yet to be pronounced, that of Ratko Mladić and that of Stanišić and Simatović. In the wording of the verdict, we can sense the will to save the legacy of international bodies and establish a coherent conclusion, in a course of jurisprudence that has undergone several moments of confusion: think of the cases of Croatian Gotovina, Kosovar Haradinaj, Serbs Perišić and Šešelj, and Bosnian Muslim Orić – all acquitted or convicted with reduced sentences, which heavily compromised the credibility of the International Tribunal for the Former Yugoslavia. The sentence is perhaps the last important occasion to restore centrality to the documents, to the actions performed, to the irrefutable proof before they become of exclusive use to historians and insiders. It is therefore useful to review the text of the sentence and the materials mentioned. These include the "Six strategic objectives" (Šest strateških ciljeva) presented by Karadžić to the Serbian-Bosnian parliament on May 12th, 1992, which suggested the separation of Sarajevo into a Serbian and a Muslim city, and the creation of "territorial corridors" scattered throughout Bosnia and Herzegovina (Semberija-Krajina, Drina, Una-Neretva, access to the sea), all to be achieved with military occupation and the expulsion of the non-Serbian population. There is Directive 7, a confidential document signed by Karadžić on March 8th, 1995, which orders the Drina Battalion to "create an unbearable situation of total insecurity, which leaves no hope of survival or life for the inhabitants of Srebrenica and Žepa". There are transcripts of the contacts between Karadžić and the military personnel operating in the transfers of hundreds of prisoners – later killed en masse – between Srebrenica, Kravica, and Zvornik in July 1995 and in the bombing of the centre of Sarajevo in May 1992, which disprove the defense's thesis that the president was not aware of the actions on the ground. It may seem paradoxical, but these documents are and will be less and less spoken of. It is true that in Bosnia and Herzegovina the past is even too oppressive in everyday life. But it is in terms of myths, projections, media bubbles, the intimate sufferings of yesterday and of today. The only tangible evidence is that of family pains, not those that can attribute a clear and mutually recognised responsibility for crimes. Those who are close to the victims accuse – understandably – fatigue and continuous retraumatisation. Those who show solidarity with the culprits develop more and more brazen revisionism techniques. If the 2016 verdict disappointed everyone, now reactions have been definitely more polarised. Civic or Bosnjak political representatives have expressed general satisfaction with the life imprisonment sentence. Associations, survivors, and family members of the victims of Srebrenica, who as in the previous cases witnessed the verdict in the TV room of the Potočari Memorial, welcomed the announcement with applause and hugs. Even in these circles, however, an element of disappointment remains. The MICT rejected the prosecution's request to convict Karadžić for genocide not only in Srebrenica, but also in seven other municipalities (Ključ, Sanski Most, Prijedor, Vlasenica, Foča, Zvornik, Bratunac). As in 2016, the ruling recognised ethnically based crimes in these municipalities, but not "genocidal intent". The recognition of Srebrenica as a unique event generates some perplexities, as it confuses the historical reading of the conflict in Bosnia and Herzegovina ("A genocide as a 'single incident' has not occurred in any known genocide. [...] Limiting genocide to a single event in 1995 contrasts with established facts", says Eric Gordy ) as well as creating an inappropriate hierarchy of victims and recognition. However, such an outcome was expected by analysts due to the absence of new elements and the expected unwillingness of the MICT to open a new jurisprudential criterion. Croatian president Kolinda Grabar Kitarović and prime minister Plenković have also favourably commented on the sentence. The only Bosnian politician who made no comment yesterday was Dragan Čović, leader of the HDZ BiH (Croatian nationalists of Bosnia). This silence clashes terribly with the persecutions suffered by thousands of Croats from Krajina, Posavina, and Sarajevo because of Karadžić's design. On the other hand, it is perfectly consistent with Čović's current political position as a loyal ally of the Bosnian Serb nationalists, that he thus avoided to embarrass. Čović behaved in the same way after Ratko Mladić's conviction in November 2017. It is a paradigmatic example of how the interests of the Bosnian ethno-party-cracy count more than anything else, even more than the memories and sufferings of their own national group. Altogether opposite reactions have come from the Bosnian-Serb political, institutional, and media representatives, all of whom agreed in criticising the sentence, without any distinction between majority and opposition. Milorad Dodik, a member of the Bosnian collective presidency, defined it "cynical and arrogant". On RTRS, the Republika Srpska TV channel, as soon as the sentence was read, the debate among studio guests turned into a concerned geopolitical reflection on the repercussions for Republika Srpska and Russia, as well as for the funding that Saudi Arabia allegedly offered the Hague Tribunal, thus earning power of interference. In the report by another Bosnian TV channel, Sarajevo's N1, all the interviewees on the street in East Sarajevo and Banja Luka wished for Karadžić's release with almost identical expressions, mirroring those of Bosnian Serb politicians: “he defended us", "he is one of us", "the satanisation of our people", "a political court". It may be that some of these comments are a sign of civil inertia, of conformity, rather than of conscious support. Still, the level of polarization of memory and coding of speech grows with the temporal distance from events. Radovan Karadžić and Ratko Mladić have lost their personal battle. However, the mobilisation in favor of their reputation, and their vision of the world, is strengthened in their country of origin. It even opens up to new spaces, it becomes international thanks to the nativist exasperation that is marking this era. It is known that Brenton Tarrant, the New Zealand terrorist who killed 50 people in the attack on the Christchurch mosque, listened to a song in honour of Karadžić as he drove to the site of the massacre, on March 15th. He also visited the Balkans in summer 2016, passing through Bosnia and Herzegovina via Trebinje and then to Croatia, as the authorities of the two countries have ascertained. These days, several observers have questioned the evocative power of Balkan nationalist myths and their connections with racial supremacy and religious hatred. During the trial, Radovan Karadžić had re-launched the principle of "holy and just war " against the Ottoman-Muslims, recalling the Balkan imaginary as a Christian-European barrier, that today is becoming more and more mainstream in the light of migratory routes, geopolitical developments, and of the crisis of socialist and liberal ideas in the EU. In a long reflection on twitter, journalist Refik Hodžić analysed the violent dehumanisation by which Karadžić mobilised his supporters against their own Muslim neighbours, labelled at the time of ethnic cleansing as "generations of occupiers", "traitors who sold the faith", "parasites to be removed". In conclusion, Hodžić asks "how to humanise what has been dehumanised", "how to re-establish communication" in post-Yugoslav societies, how to avoid the harmful legacy of segregation. Still starting from the Tarrant-Karadžić case, Bosnian historian Edin Hajdarpasić in the Washington Post examined the transnational, emulative roots of right-wing extremism. Hajdarpasić writes that since the 1930s European and American ultra-nationalisms have "learned from one another", dreaming of a world of nations while maintaining an international inspirational dimension. And the same is happening today, with much faster tools. 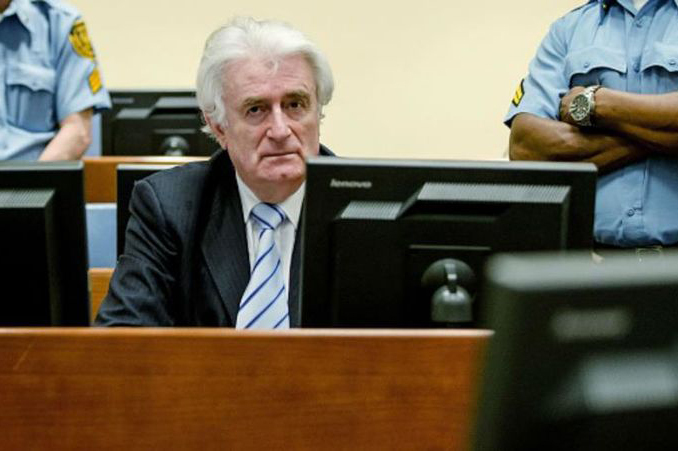 While his ideas circulate, Radovan Karadžić, the "good neighbour", will serve a life sentence in a still unknown state, which will be indicated among the countries adhering to the ICTY convention. An unknown destination is now waiting for him, as happened to the approximately two million refugees forced to leave their homes by the ethnic cleansing of the nineties, and to the thousands of migrants who, every year, leave Bosnia and Herzegovina in search of a more prosperous and human future.